Paradox Interactive is using an alternate reality game (ARG) dating app to drop hints that something new is coming to the Vampire: The Masquerade series on 21st March, 2019. Tender - a recently launched dating app that matches people via their blood type (thanks PC Gamer, GameInformer) - may look legit, but fans soon discovered that players with a Paradox account could, somewhat inexplicably, log in. 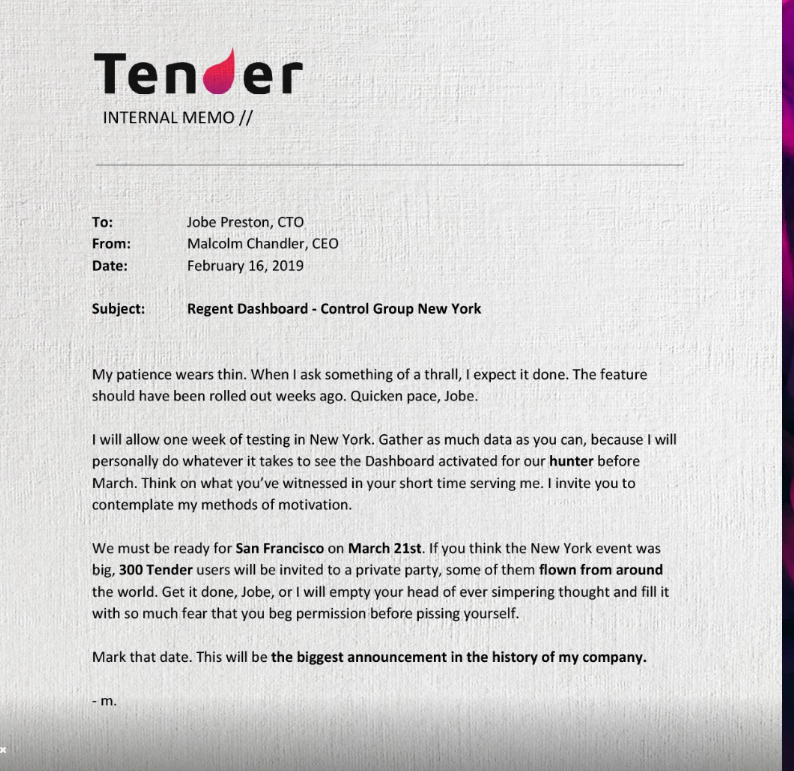 Codes hidden within some of the videos in the app, along with suspicious "leaked" memos from Tender CEO Malcolm Chandler (which just-so-happens to be the same name as the author of "Vampire Brides from Planet Hell") all add to the intrigue, not least because the latest of Chandler's memos uses a heap of vampiric terms. Furthermore, this clip from a recent Tender livestream shows Santa Monica Pier... which is also one of the key locations in Bloodlines, of course. Curiouser and curiouser. "We must be ready for San Francisco on March 21st," wrote Chandler in the memo. "300 Tender users will be invited to a private party, some of them flown from around the world. "Mark that date. This will be the biggest announcement in the history of my company." 21st March in San Francisco also just-so-happens to exactly when this year's Game Developers Conference is scheduled to take place. Coincidence? I guess. Maybe. We'll find out for sure one way or the other on 21st March, eh?